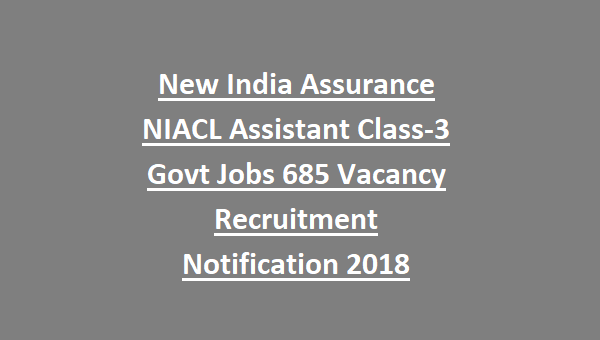 NIACL Assistant Class-3 Recruitment/Exam 2018: New India Assurance Company Limited released a recruitment notification for Assistant Jobs on regular basis. As many as 685 vacancies are announced to be recruited through NIACL Assistant Class-3 Recruitment Board for the current year. There are total 685 vacancies opened under NIACL Assistant Class-3 Recruitment for the current year. Note: For category-wise distribution of vacancies refer the official notification dated 16-07-2018. Candidates applying must be below 30 years and above 21 years as reckoned on 01-07-2018. Category-wise relaxation of upper age is applicable as per the rules, refer the official notification for the same. Candidates desirous to join as Assistant Class-III cadre must be a Graduate in any discipline from a recognized University. Must know regional language of the desire state of recruitment. Selected candidates will be appointed on a proposed salary of Rs. 14,435/- to Rs. 40,080/- per month. Other allowances/benefits included as per the rules. Candidates interested can apply online through the official website http://newindia.co.in/ before the last date i.e. 31st July 2018. 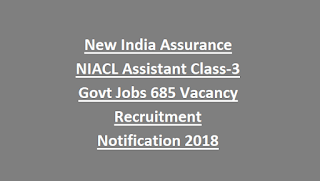 Candidates seeking possession under NIACL Assistant Class-3 Jobs Recruitment 2018 can refer the official notification.